Left to right, Young Machinists Kevin Vazquez, George King, Rob Carver, Rachael Sarzynski, Andrew Dennis, Kenda McKinzey and Uly Ruiz joined other labor and progressive groups to protest Wisconsin Gov. Scott Walker’s appearance at a conservative fundraiser in Seattle. IAM District 751 Young Machinists have made it clear: Wisconsin Republican Gov. 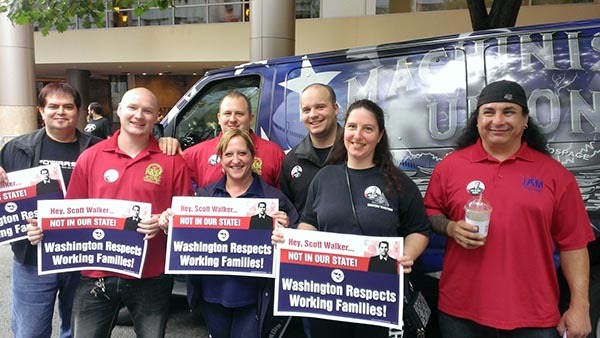 Scott Walker’s anti-union rhetoric isn’t welcome in Washington State. The group came together on short notice to join a recent protest of Walker’s appearance at a conservative think tank’s fundraising event in Seattle. In a little over two years as governor, Walker has managed to curb freedom to bargain collectively and pass corporate tax cuts while gutting health care and education budgets. Brown says the group wanted to let Walker know that his broken policies wouldn’t fly in Washington State, where the rate of union membership is more than twice the national average. The Young Machinists is a group of energetic IAM members who want to see their generation become more involved in the labor movement and active on the issues that affect their future. Click here to follow the Young Machinists on Facebook.